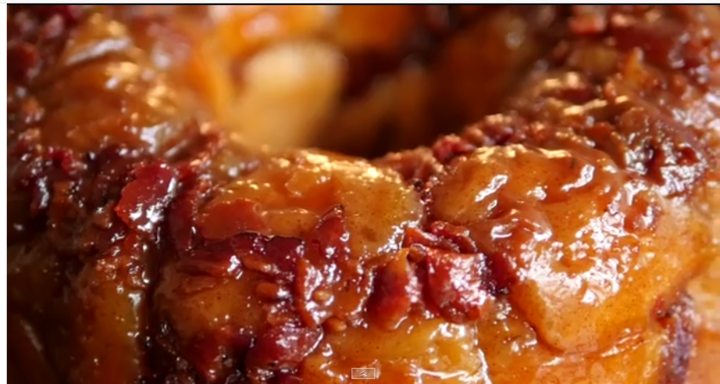 Ever had one of those maple donuts with bacon on top? They’re delicious. No one disagrees with this. It’s a known fact of the world, kind of like gravity. Well, this is like that, but a hundred times better! But don’t just take my word for it. Try it for yourself. And once you’ve recovered from your food coma you can come back and tell how right I was. Preheat oven to 350º F and grease a bundt pan with butter or nonstick spray. Open your biscuit packages and cut each biscuit into quarters. Combine sugar with cinnamon in a gallon-sized plastic bag, then seal it and shake to mix together. Open bag and add in biscuit quarters. Seal bag, then vigorously shake until cinnamon sugar mixture evenly coats all the pieces of dough. Starting with a layer of bacon in the bottom, layer bacon, caramel, and dough pieces in the pan. In a microwaveable bowl melt butter, brown sugar, and salt together for 1 minute (at intervals of 20-30 seconds). Add maple syrup and stir mixture until combined. Pour over the dough in your bundt pan. Squish pieces down into the butter mixture so they’re all coated and/or submerged. Place bundt pan on a baking tray and bake for 40-45 minutes, or until dough is cooked through to your liking. Invert onto a serving plate. Serve hot and enjoy!